A teenager accused of being involved in a street attack that hospitalised a Kurdish student told a court he "panicked" after being provoked. 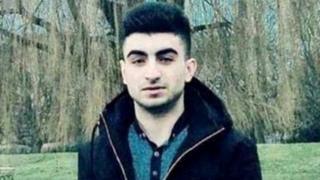 Reker Ahmed had his spine fractured during a "brutal" late-night assault in Croydon, south London, on 31 March. Kurt Killick, 18, told Croydon Crown Court violence broke out after an accomplice of Mr Ahmed became "aggressive" towards his friends. Mr Killick, four other men and a woman all deny being part of the attack. Seventeen-year-old Mr Ahmed also suffered a fractured eye socket and a bleed on the brain after being subjected to two attacks over the course of 16 minutes. Mr Killick said Mr Ahmed and another man called Dilshad Mohammed came up to him as he was among a group of people outside The Goat Pub. Mr Mohammed asked the group for marijuana and cigarettes and then started to get "aggressive" before a fight broke out, Mr Killick told the court. Mr Killick admitted pushing Mr Ahmed to the floor and "kicking him twice in the legs" to defend one of his friends. He said: "I just saw him go for my friend as I ran forward I thought he was going to attack George [Walder]. I panicked really." Mr Killick said Mr Ahmed got straight back up from the ground after he kicked him.